Theodore Meir Bikel (/bɪˈkɛl/ bih-KEL; May 2, 1924 – July 21, 2015) was an Austrian-American actor, folk singer, musician, composer, unionist and political activist. He appeared in films including The African Queen (1951), Moulin Rouge (1952), The Enemy Below (1957), I Want to Live! (1958), My Fair Lady (1964) and The Russians Are Coming, the Russians Are Coming (1966). For his portrayal of Sheriff Max Muller in The Defiant Ones (1958), he was nominated for the Academy Award for Best Supporting Actor. He made his stage debut in Tevye the Milkman in Tel Aviv, Israel, when he was in his teens. He later studied acting at Britain's Royal Academy of Dramatic Art and made his London stage debut in 1948 and in New York in 1955. He was also a widely recognized and recorded folk singer and guitarist. In 1959, he co-founded the Newport Folk Festival and created the role of Captain von Trapp opposite Mary Martin as Maria in the original Broadway production of Rodgers & Hammerstein's The Sound of Music. In 1969, Bikel began acting and singing on stage as Tevye in the musical Fiddler on the Roof, a role he performed more often than any other actor to date. The production won nine Tony Awards and was one of the longest-running musicals in Broadway history. Bikel was president of the Associated Actors and Artistes of America until 2014, and was president of Actors' Equity in the late 1970s and early 1980s. He served as the Chair of the Board of Directors of Partners for Progressive Israel, where he also lectured. 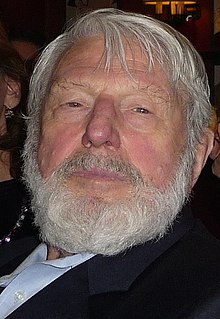 Theodore Bikel was born into a Jewish family in Vienna, Austria, the son of Miriam (née Riegler) and Josef Bikel, from Bukovina. As an active Zionist, his father named him after Theodor Herzl, the founder of modern Zionism. Following the German union with Austria in 1938, Bikel's family fled to Mandatory Palestine, where his father's contacts helped the family obtain British passports. Bikel studied at the Mikve Yisrael agricultural school and joined Kibbutz Kfar HaMaccabi. Bikel started acting while in his teens. He performed with Habimah Theatre in 1943 and was one of the founding members of the Cameri Theatre, which became a leading Israeli theatre company. He described his acting experience there as similar to, if not better than, the Method acting techniques taught at the Actors Studio in New York. "The Habimah people were much closer to the Method, indeed, than Lee Strasberg was, because they were direct disciples of Stanislavski." In 1945, he moved to London to study at the Royal Academy of Dramatic Art. Bikel moved to the United States in 1954 and became a naturalized citizen in 1961. In 1948, Michael Redgrave recommended Bikel to his friend Laurence Olivier as understudy for the parts of both Stanley Kowalski and Harold "Mitch" Mitchell in the West End premiere of Tennessee Williams' A Streetcar Named Desire. Aside from being an understudy, Bikel's main role in the production was the relatively minor part of Pablo Gonzales. However, he graduated from supporting actor and understudy to star opposite the director's wife, Vivien Leigh, with a sudden unplanned performance when a co-star, playing the role of Mitch, came down with a case of flu. Bikel showed up backstage and went directly to Leigh's dressing room to ask if she wanted to rehearse with him, to make sure he was right for the role. She replied that she did not need to: "Go and do it," she said. "You are a professional, and Larry gave you this job because he trusted you to do it well." After the show, Leigh told him, "Well done." For most of his acting career, he became known for his versatility in playing characters of different nationalities, claiming he took on those different personalities so his acting would "never get stale." On television, he played an Armenian merchant on Ironside, a Polish professor on Charlie's Angels, an American professor on The Paper Chase, a Bulgarian villain on Falcon Crest, a Russian on Star Trek: The Next Generation, and an Italian on Murder, She Wrote. In movies, he played a German officer in The African Queen (1951) and The Enemy Below (1957), a Southern sheriff in The Defiant Ones, and a Russian submarine captain in the comedy The Russians Are Coming, the Russians Are Coming (1966). He also portrayed the sadistic General Jouvet in The Pride and the Passion (1957), and was screen tested for the role of Auric Goldfinger in the James Bond film Goldfinger (1964). In My Fair Lady (1964), he played an overbearing Hungarian linguist. He made his Broadway debut in 1955 in "Tonight in Samarkand" and in 1958 was nominated for a Tony for "The Rope Dancers". In 1959, he created the role of Captain von Trapp in the original production of The Sound of Music, which earned him a second Tony nomination. However, Bikel did not like his role because his ability to sing was underutilized, nor did he like performing the same role of the Captain repeatedly. When the composers, Rodgers and Hammerstein, realized Bikel was an accomplished folksinger, they wrote the song "Edelweiss" specifically for him to sing and accompany himself on the guitar. In 1964, he played Zoltan Karpathy, the dialect expert, in the film version of My Fair Lady. Since his first appearance as Tevye in the musical Fiddler on the Roof (1967), Bikel had performed the role more often than any other actor (more than 2,000 times). When an injury required 74-year-old fellow Israeli performer Chaim Topol (veteran of many productions of the stage show and star of the motion picture of Fiddler on the Roof) to withdraw from a high-budget, much-promoted 2009 North American tour of the musical, Bikel substituted for him in several appearances in 2010. Bikel was a guest star on many popular television series. He appeared in an episode of the 1954 NBC legal drama Justice based on cases from the Legal Aid Society of New York. He also appeared in the episode entitled "The Faithful Pilgrimage" of CBS's Appointment with Adventure anthology series. The particular episode was written by Rod Serling. He also appeared in a second episode of Appointment with Adventure entitled "Return of the Stranger". Bikel also appeared in an acting role in Frank Zappa's experimental film 200 Motels (1971). Bikel later guest-starred on Rod Serling's The Twilight Zone (episode "Four O'Clock" as Oliver Crangle). He appeared on episodes of Wagon Train, Combat! in the season 3 episode "Mountain Man" as Francois Perrault, Hawaii Five-O, Columbo (1977, "The Bye-Bye Sky High I.Q. Murder Case"), Charlie's Angels, The San Pedro Beach Bums, Cannon, Little House on the Prairie, Mission: Impossible, Gunsmoke, Dynasty, All in the Family, Knight Rider, Murder, She Wrote, Fantasy Island, Law & Order, and Mickey Spillane's Mike Hammer (episode "Elegy for a Tramp" as Gerringer and aired on January 28, 1987). In the early 1990s, he appeared on Star Trek: The Next Generation, in the episode "Family", playing Sergey Rozhenko, the Russian-born adoptive father of Worf. Bikel performed two roles in the Babylon 5 universe, in 1994 as Rabbi Koslov in the first-season episode "TKO" and in 1998, as Ranger leader Lenonn in the TV movie Babylon 5: In the Beginning. Bikel was nominated for the Drama Desk Award in 2010 for outstanding solo performance for Sholom Aleichem: Laughter Through Tears, an off-Broadway play which he also wrote. In 2012, Bikel played the title role in Visiting Mr. Green with the Harold Green Jewish Theatre Company in Toronto, Ontario. In 2013, Bikel starred in Journey 4 Artists, a documentary which celebrates the power of music and religious diversity. In 1955, at the suggestion of Jac Holzman of Elektra Records, Bikel began recording songs, including several albums of Jewish folk songs and songs from Russia and other countries, making over 20 contemporary and folk music albums during his career. For those, he played acoustic guitar alone or accompanied by other musicians. He was able to sing in 21 different languages, including Yiddish, Hebrew, German, Russian, Hungarian, Romanian, French, medieval Spanish, Zulu and English. His early albums included Israeli Folk Songs (1955) and Songs of Russian Old & New (1960). One of his Russian albums was entitled Songs of a Russian Gypsy, in 1958, where he introduced the folk tune, "Kretchma." Bikel's live performances were issued on two albums: Bravo Bikel (1959), and Bikel on Tour(1963). In 1959, Bikel co-founded the Newport Folk Festival (together with Pete Seeger, Harold Leventhal, Oscar Brand and George Wein). He performed a number of recorded duets with Judy Collins at various festivals and on television. During an interview, when asked what inspired him to become involved in organizing a folk festival, he said that music was "one of the few answers to the chaos that we have," one of the only recourses to avoid social strife, and a means of giving youth hope for a better world. Bikel viewed then 21-year-old Bob Dylan as one of those young performers expressing emotional and social messages through song. In 1963, Bikel joined Dylan, Seeger, Peter, Paul and Mary and Joan Baez for the festival grand finale as they sang "Blowin' in the Wind" and "We Shall Overcome." Following the festival, Bikel, Seeger and Dylan traveled to a planned rally in Greenwood, Mississippi to perform Dylan's newly-written song, "Only a Pawn in Their Game," about the man who murdered Medgar Evers, head of the NAACP. Originally, only Bikel and Seeger were scheduled to perform, but Bikel wanted Dylan to go with them. He told Dylan's manager, Albert Grossman, "I'll tell you what. Buy him a ticket. Don't tell him where it came from. Tell him it's time to go down and experience the South." Bikel's close friendship with Seeger was sometimes tested as a result of the festival's choice of performers. On one occasion, Seeger became infuriated and wished he had an ax to cut the electrical cables because of the poor audio during Bob Dylan's legendary performance accompanied by the Paul Butterfield Blues Band. Seeger expected Bikel to support him: "Theo, for Chrissake—tell them. Set them straight!" Bikel stepped forward and told Seeger, "Peter, this band, these rebels—they are us. They are what we were twenty years ago. Remember?" Seeger stared at him "like a trauma victim", as Bikel succeeded in calming Seeger down enough to let the group finish their songs. In 1965, Bikel, as well as Seeger, was shocked when Bob Dylan turned electric at the Festival, an event some call "Dylan's declaration of musical independence." In 1962, Bikel became the first singer besides Dylan to perform "Blowin' in the Wind" in public. His album A Folksinger's Choice (1964) featured Jim McGuinn (as he was then known) on banjo. Bikel (with business partner Herb Cohen) opened the first folk music coffee house in Los Angeles, The Unicorn. Its popularity led to the two opening a second club, Cosmo Alley, which in addition to folk music presented poets such as Maya Angelou and comics including Lenny Bruce. Bikel became increasingly involved with civil rights issues and progressive causes, and was a delegate to the 1968 Democratic Convention. Bikel was married four times. He married Ofra Ichilov in 1942. They divorced the following year. His second marriage was in 1967 to Rita Weinberg Call with whom he had two children. They divorced in 2008. He married conductor Tamara Brooks later that year. She died in 2012. He married journalist and foreign correspondent Aimee Ginsburg on December 29, 2013. Bikel died on July 21, 2015, at Ronald Reagan UCLA Medical Center in Los Angeles of natural causes, according to publicist Harlan Boll. Bikel is survived by his wife, Aimee Ginsburg, his sons from his second marriage, Robert and Daniel, and four grandchildren. He was buried at Hillside Memorial Park Cemetery in Culver City, California. Bikel was a longtime activist in the civil rights and human rights movements, participating as a fundraiser with performances. He co-founded the Actors Federal Credit Union in 1962, and in 1968 he was a delegate to the Democratic National Convention in Chicago. He was president of Actors' Equity from 1977 to 1982 in which office he supported human rights causes. Since 1988 he had been president of the Associated Actors and Artistes of America. Upon hearing of his death, Actors’ Equity wrote: "From the time he joined Equity in 1954, Bikel has been an advocate for the members of our union and his extraordinary achievements paved the way for so many. No one loved theater more, his union better or cherished actors like Theo did. He has left an indelible mark on generations of members past and generations of members to come. We thank you, Theo, for all you have done." Bikel was an active supporter and campaigner for John F. Kennedy. He did some of his campaigning during the run of The Sound of Music which got him into trouble with the producers, who did not think it was becoming for an actor. He recalls, "I would go out sometimes between matinee and evening performances, go to a rally and speak from a flat-bed truck, and then come back to the theater." The producers stopped complaining, however, when after one show he was picked up backstage by a limousine carrying Eleanor Roosevelt, and he accompanied her to a Democratic rally as her special guest. At the 1977 AFL–CIO Convention, Bikel welcomed the Russian dissident Vladimir Bukovsky upon his release from the Soviet Union. He was arrested in front of the Soviet Embassy in Washington in 1986 while protesting the plight of Soviet Jews. President Jimmy Carter appointed him to serve on the National Council for the Arts in 1977 for a six-year term. In 2007, he served as chair of the Board of Directors of Meretz USA (now Partners for Progressive Israel). He was a member of the High IQ collective Mensa International. Bikel, Theodore (2002). Theo: An Autobiography. University of Wisconsin Press. ISBN 978-0299182847. ^ "THE 31ST ACADEMY AWARDS - 1959". Oscars.org. Academy of Motion Picture Arts and Sciences. Retrieved 13 March 2018. ^ "About Partners for Progressive Israel". Archived from the original on 21 November 2012. ^ "Theodore Bikel Biography (1924–)". filmreference.com. Retrieved 6 July 2015. ^ a b David B. Green, This Day in Jewish History / Singer, actor and activist Theodore Bikel is born Haaretz, February 5, 2014. Retrieved November 16, 2014. ^ "Renowned actor and folk singer Theodore Bikel and conductor Tamara Brooks to visit Vassar College as Artists in Residence. February 10–18, 2008". Poughkeepsie, New York: Vassar College. 15 January 2008. Archived from the original on 29 August 2008. ^ a b c d e f g h i j k l Severo, Richard; Blumenthal, Ralph (21 July 2015). "Theodore Bikel, Master of Versatility in Songs, Roles and Activism, Dies at 91". The New York Times. p. A24. ^ Ivry, Benjamin (21 July 2015). "Remembering Theo Bikel, a fighter to the end". Forward. Retrieved 6 August 2018. ^ Barnes, Alan; Hearn, Marcus. Kiss Kiss Bang! Bang!. The Overlook Press. p. 34. ISBN 087951874X. ^ Slater, Robert (6 February 2013). "One more fiddle for the road". The Jerusalem Post. Retrieved 28 September 2014. ^ "Justice". The Classic TV Archive. Archived from the original on 8 October 2011. Retrieved 24 October 2013. ^ "VISITING MR. GREEN - Harold Green Jewish Theatre Company - Professional Plays in Toronto". Hgjewishtheatre.com. 18 February 2012. Retrieved 23 July 2015. ^ "Journey 4 Artists (2013)". IMDb.com. Retrieved 24 July 2015. ^ "Journey 4 Artists ; A Michele Noble film". Journey4artists.com. Retrieved 24 July 2015. ^ Theodore Bikel — Kretchma (קרעטשמע). YouTube. 22 May 2013. ^ a b c d e f g h i j k l m n o p q r s t u v w Strong, Martin C. (2010). The Great Folk Discography: Pioneers and Early Legends. Edinburgh: Polygon Books. pp. 25–26. ISBN 978-1-84697-141-9. ^ Judy Collins & Theodore Bikel – Newport Festival 1942. YouTube. 21 July 2015. ^ Judy Collins & Theodore Bikel – Kisses Sweeter Than Wine, 1963, from HOOTENANNY. YouTube. 12 December 2013. ^ a b video: "THEODORE BIKEL – INTERVIW – 1963 NEWPORT FESTIVAL", 4 min. ^ Rollins, Peter, ed. (12 September 2010). Hollywood's White House: The American Presidency in Film and History. University Press of Kentucky. ISBN 0813127920. ^ Chenoweth (1992, p. 4): Chenoweth, Eric (Summer 1992). "The gallant warrior: In memoriam Tom Kahn" (PDF). Uncaptive Minds: A Journal of Information and Opinion on Eastern Europe. 1718 M Street, NW, No. 147, Washington DC 20036, USA: Institute for Democracy in Eastern Europe (IDEE). 5 (20, number 2): 5–16. ISSN 0897-9669. Archived from the original (PDF) on 19 October 2015. ^ Kennedy, Mark (21 July 2015). "Home> Entertainment Stage and Film Star Theodore Bikel Dies in LA at 91". ABC News. Retrieved 21 July 2015. ^ Grosswirth, Marvin; Salny, Abbie F. (23 January 1983). The Mensa genius quiz. Addison-Wesley Publishing. p. 148. ISBN 978-0-201-05958-8. ^ Bikel, Theodore (4 July 2006). "Theodore Bikel - Bio". Bikel.com. Retrieved 23 July 2015. ^ "Theodore Bikel". The Hollywood Chamber of Commerce. ^ "Reply to a parliamentary question" (PDF) (in German). p. 1919. Retrieved 31 January 2013. ^ "Judaica Sound Archives : Folk Songs Of Israel-Theodore Bikel & Nico Feldman". Faujsa.fau.edu. Archived from the original on 22 July 2015. Retrieved 24 July 2015. ^ "Theodore Bikel - "Edelweiss" from THE SOUND OF MUSIC". YouTube. Retrieved 23 July 2015. ^ & This album was later retitled Theodore Bikel does "Song of Songs" and other Biblical Prophecies (reissued on Everest Records with Marian Seldes as Shulamit.). ^ "The King and I (Studio Cast Recording (1964)): Studio Cast of The King and I (1964): MP3 Downloads". Amazon.com. Retrieved 23 July 2015. ^ "THEODORE BIKEL - a new day LP - Amazon.com Music". Amazon.com. Retrieved 23 July 2015. ^ "Theodore Bikel: For The Young: Music". Amazon.com. Retrieved 23 July 2015. ^ Theodore Bikel. "Theodore Bikel: Classic Jewish Holiday & Shabbat Songs: Music". Amazon.com. Retrieved 23 July 2015. ^ "Sephardic Song, Yehezkel Braun, Andre Hajdu, Elliot Z. Levine, Louis Lewandowski, Charlie Morrow, Moyshe Oysher, Salomone Rossi, Western Wind Vocal Ensemble - The Passover Story - Narrated by Theodore Bikel with Traditional Music". Amazon.com. Retrieved 23 July 2015. ^ "Theodore Bikel, Western Wind Ensemble: Chanukkah Story: Music". Amazon.com. Retrieved 23 July 2015. ^ "Frieda Enoch Noble Voices Theodore Bikel - Rise Up and Fight! Songs of Jewish Partisans - Amazon.com Music". Amazon.com. Retrieved 23 July 2015. ^ "A Taste of Passover: Theodore Bikel: Movies & TV". Amazon.com. Retrieved 23 July 2015. ^ "Various Artists - A Taste of Chanukah - Amazon.com Music". Amazon.com. Retrieved 23 July 2015. ^ "Theodore Bikel". Theodore Bikel. Retrieved 6 July 2015. ^ "Freedman Catalogue lookup: work Theodore Bikel/Alberto Mizrahi / Our Song". upenn.edu. Wikimedia Commons has media related to Theodore Bikel. Interview with Theodore Bikel – Ames Tribune, January 24 10, 2015.